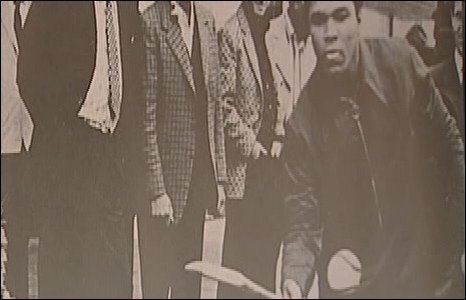 Legendary American boxer Muhammad Ali has unveiled a plaque commemorating his Irish roots during a visit to the town from where his great-grandfather emigrated to the US. Thousands of people turned out to give Ali a rapturous welcome to the western Irish town of Ennis, in County Clare. The 67-year-old was made first honorary freeman of the town, the streets of which were decorated with pictures of the boxer in his prime. The honour - conferred by the town council - also recognised Ali's sporting achievements and charity work. Ali's ancestor, Abe Grady, lived on the Turnpike Road in the town, before moving in the 1860s to the US, where he married an African-American freed slave. The BBC's Charu Shahane says it was more like a presidential visit than a welcome for a long lost son. Ali - who suffers from Parkinson's disease - did not address the crowd, but spectators chanted his name while he shadow-boxed. His visit brought back memories of previous trips to Ireland. The three-times world heavyweight champion fought in July 1972 at Dublin's Croke Park, where he was victorious over Al Blue Lewis in a non-title bout. 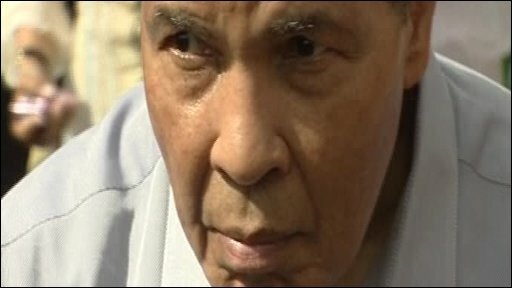 Ali also made a moving visit to Ireland during the 2003 Special Olympics.